(CNN) -- Some 220 square miles of ice has collapsed in Antarctica and an ice shelf about seven times the size of Manhattan is "hanging by a thread," the British Antarctic Survey said Tuesday, blaming global warming. Scientists say the size of the threatened shelf is about 5,282 square miles. "We are in for a lot more events like this," said professor Ted Scambos, a glaciologist at the National Snow and Ice Data Center at the University of Colorado at Boulder. Scambos alerted the British Antarctic Survey after he noticed part of the Wilkins ice shelf disintegrating on February 28, when he was looking at NASA satellite images. "The amazing thing was, we saw it within hours of it beginning, in between the morning and the afternoon pictures of that day," Scambos said of the large chunk that broke away on February 28. Another 220 square miles -- including the chunk that Scambos spotted -- had splintered from the ice shelf as of March 8, the group said. "As of mid-March, only a narrow strip of shelf ice was protecting several thousand kilometers of potential further breakup," the group said. Once Scambos called the British Antarctic Survey, the group sent an aircraft on a reconnaissance mission to examine the extent of the breakout. "We flew along the main crack and observed the sheer scale of movement from the breakage," said Jim Elliott, according to the group's Web site. "Big hefty chunks of ice, the size of small houses, look as though they've been thrown around like rubble -- it's like an explosion," he said. "Wilkins is the largest ice shelf on the Antarctic Peninsula yet to be threatened," David Vaughan of the British Antarctic Survey said, according to the Web site. "I didn't expect to see things happen this quickly. The ice shelf is hanging by a thread -- we'll know in the next few days or weeks what its fate will be." But with Antarctica's summer ending, Scambos said the "unusual show is over for this season." Ice shelves are floating ice sheets attached to the coast. Because they are already floating, their collapse does not have any effect on sea levels, according to the Cambridge-based British Antarctic Survey. Scambos said the ice shelf is not currently on the path of the increasingly popular tourist ships that travel from South America to Antarctica. But some plants and animals may have to adapt to the collapse. "Wildlife will be impacted, but they are pretty adept at dealing with a topsy-turvy world," he said. "The ecosystem is pretty resilient." Several ice shelves -- Prince Gustav Channel, Larsen Inlet, Larsen A, Larsen B, Wordie, Muller and Jones -- have collapsed in the past three decades, the British Antarctic Survey said. 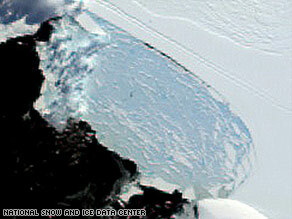 Larsen B, a 1,254-square-mile ice shelf, comparable in size to the U.S. state of Rhode Island, collapsed in 2002, the group said. Scientists say the western Antarctic peninsula -- the piece of the continent that stretches toward South America -- has warmed more than any other place on Earth over the past 50 years, rising by 0.9 degrees Fahrenheit each decade. Scambos said the poles will be the leading edge of what's happening in the rest of the world as global warming continues. "Even though they seem far away, changes in the polar regions could have an impact on both hemispheres, with sea level rise and changes in climate patterns," he said. News of the Wilkins ice shelf's impending breakup came less than two weeks after the United Nations Environment Program reported that the world's glaciers are melting away and that they show "record" losses. "Data from close to 30 reference glaciers in nine mountain ranges indicate that between the years 2004-2005 and 2005-2006 the average rate of melting and thinning more than doubled," the UNEP said March 16. CNN's Marsha Walton contributed to this report.